Introducing the Life Latch® patented child-resistant, senior-friendly, tamper-evident, moisture-resistant, vacuum-tight, open-head container! We are proud to present the newest moisture barrier product to hit the market, the Life Latch recloseable moisture-resistant and vacuum-tight plastic buckets. 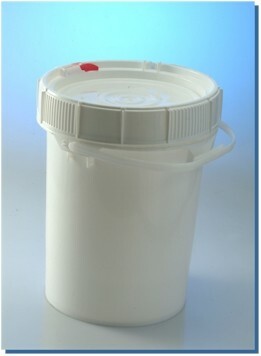 The recloseable screw top lid allows you to reseal your bucket quickly and hassle free. The lid includes a treated gasket for a vacuum-tight seal every time. Width at the widest point: 12.6"
Overall height with lid: 16"
U.N. Certified for 66 lb. Solid - 1H2/Y30/S/yr. of mfg. USA. In many cases, the easy-to-use lid is ideal for products which do not require the U.N. certification but a product ideal for consumers. STRONG * DURABLE * EASY TO USE!